Author(s): Philippe Leff-Gelman, Carlos Cruz-Fuentes, Juan Pablo Reyes-Grajeda, Ismael Mancilla-Herrera, Margarita Lopez-Martinez, Rocio Guerrero Bustos, Monica Leticia Malagon Gomez, Monica Flores-Ramos. National Institute of Perinatology, Department of Neuroscience, Montes Urales # 800, Mexico City (DF), 11000, Mexico. 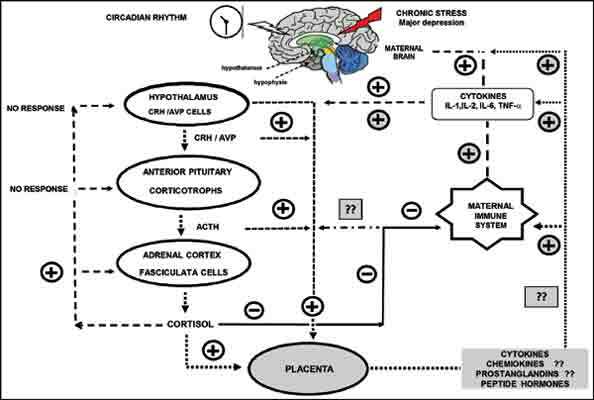 Abnormal function of the hypothalamic–pituitary–adrenal (HPA) axis along with the sympathetic-adrenalmedullary (SAM) axis represents the hallmark pathological findings in non-pregnant and pregnant women exhibiting major depressive disorder (MDD). Perinatal depression is highly prevalent, with an estimated prevalence exceeding 10% in most high-income countries. Pregnant women experience more stressful life events than non-pregnant women. Pregnant women with MDD show higher baseline levels of cortisol, increased levels of proinflammatory cytokines, and higher levels of hypothalamic-pituitary peptide hormones, catecholamines, and low dehydroepiandrosterone (DHEA) levels in plasma compared to those without MDD. During pregnancy the innate immune system and placental factors play crucial roles in the development of the conceptus to its full term. These factors when altered may generate a persistent dysfunction of the HPA axis that could lead to an overt transfer of cortisol and toxicity to the fetus at the expense of reduced activity of placental 11β-hydroxysteroid dehydrogenase Type 2 (11β-HSD-2). Epigenetic modifications (DNA methylation) of gene enhancers of the glucocorticoid receptor (GR) in addition to the corticotrophin-releasing hormone (CRH) and arginine-vasopressin (AVP) among other brain and placental molecules, may significantly contribute to the expression of depression during pregnancy. Pregnant women exhibiting affective disorders have a higher risk of generating preterm babies with high rates of morbidity and mortality and negative outcomes in child development compared to pregnant women without these disorders. Affective disorders in pregnant women should be taken seriously, and therapies focused in reducing or at most preventing the deleterious effects induced by stressors should be implemented to promote the welfare of both mother and baby. The goal of this paper is to describe the modulatory role of distinct paracrine and endocrine mediators including epigenetics of hormone receptors that drive the abnormal activity of the HPA axis in perinatal depression. Keywords: Brain, depression, glucocorticoids, neuroendocrine, peptides, pregnancy, receptors, stress. Affiliation:National Institute of Perinatology, Department of Neuroscience, Montes Urales # 800, Mexico City (DF), 11000, Mexico. Keywords:Brain, depression, glucocorticoids, neuroendocrine, peptides, pregnancy, receptors, stress. Abstract:Abnormal function of the hypothalamic–pituitary–adrenal (HPA) axis along with the sympathetic-adrenalmedullary (SAM) axis represents the hallmark pathological findings in non-pregnant and pregnant women exhibiting major depressive disorder (MDD). Perinatal depression is highly prevalent, with an estimated prevalence exceeding 10% in most high-income countries. Pregnant women experience more stressful life events than non-pregnant women. Pregnant women with MDD show higher baseline levels of cortisol, increased levels of proinflammatory cytokines, and higher levels of hypothalamic-pituitary peptide hormones, catecholamines, and low dehydroepiandrosterone (DHEA) levels in plasma compared to those without MDD. During pregnancy the innate immune system and placental factors play crucial roles in the development of the conceptus to its full term. These factors when altered may generate a persistent dysfunction of the HPA axis that could lead to an overt transfer of cortisol and toxicity to the fetus at the expense of reduced activity of placental 11β-hydroxysteroid dehydrogenase Type 2 (11β-HSD-2). Epigenetic modifications (DNA methylation) of gene enhancers of the glucocorticoid receptor (GR) in addition to the corticotrophin-releasing hormone (CRH) and arginine-vasopressin (AVP) among other brain and placental molecules, may significantly contribute to the expression of depression during pregnancy. Pregnant women exhibiting affective disorders have a higher risk of generating preterm babies with high rates of morbidity and mortality and negative outcomes in child development compared to pregnant women without these disorders. Affective disorders in pregnant women should be taken seriously, and therapies focused in reducing or at most preventing the deleterious effects induced by stressors should be implemented to promote the welfare of both mother and baby. The goal of this paper is to describe the modulatory role of distinct paracrine and endocrine mediators including epigenetics of hormone receptors that drive the abnormal activity of the HPA axis in perinatal depression.